Valero est une entreprise de raffinerie Américaine. C’est un grand fabricant et distributeur de carburants, produits pétrochimiques et énergie. Ever-escalating environmental standards mean that the world’s most demanding industrial locations are facing a new set of requirements. Not only do they need smart new lighting ideas and innovative approaches to enhancing safety, they also need lighting that reduces CO2 emissions, improves energy efficiency and cuts the overall cost of ownership. Valero continues working to meet the U.S.’s growing demand for clean fuels. Over the years, the company has invested billions of dollars to produce the clean fuels that adhere to new clean fuels standards while continuing to meet the growing demand of U.S. consumers. Taking a step further in this approach, it has invested in the latest technology to improve energy efficiency at its refineries. 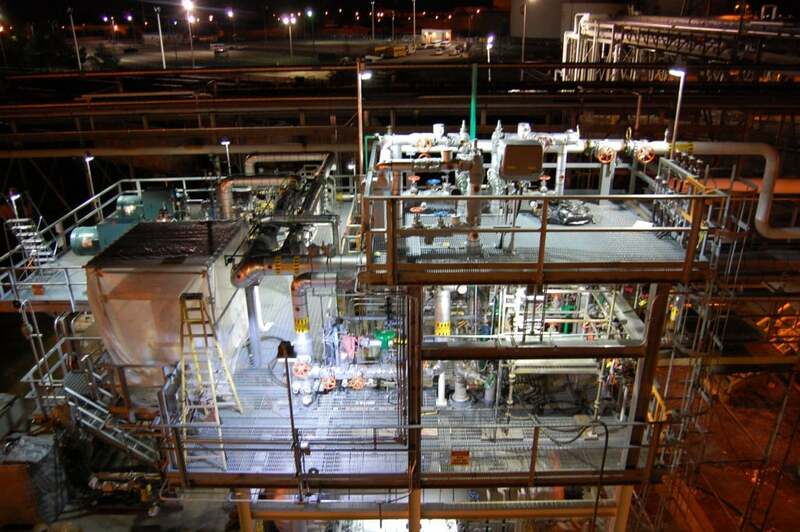 Valero, the largest refiner in North America, partnered with Dialight, world leader in industrial LED lighting solutions, to implement a new, energy efficient, safe and environmentally friendly lighting approach. By taking a new approach to lighting and replacing its traditional lighting with LED fixtures from Dialight, Valero was able to improve the quality of lighting while also reducing its energy consumption and accessing many additional business and operational benefits. For Valero the efficient optics used in LED Hazloc (hazardous location) products like SafeSite® result in more light reaching the target area compared to the previous HPS installation at the plant. Using lower wattage than conventional lighting, fewer LED fixtures are needed to address the same job, so fewer fixtures are needed to light a given area. More light is focused on straight lines where it is needed and spillage is limited to just a few feet. This not only reduces energy needs, but also cuts installation time and costs while the LEDs’ long lifespan cuts maintenance to zero. The combination of reduced energy consumption, a 50% cut in the number of lighting fixtures, a fixture life warranty of 5 years with over 50,000 operating hours and the resulting reduction in maintenance clearly produces a low cost of ownership for Valero. Valero’s first priority was safety and improved lighting. 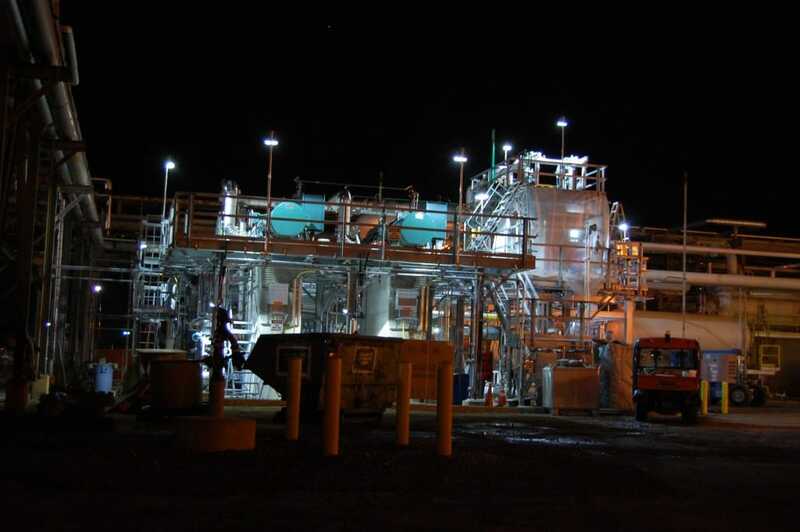 When refinery employees had to make use of an additional portable light at night, even with a direct fixture above the equipment, it was clearly time for a change in lighting strategy for Valero. With color rendering of only Ra 30, high pressure sodium (HPS) lighting makes it difficult for workers to distinguish between different colors. Objects appear colorful because they absorb some colors of light and reflect other colors to our eyes. For example, an object that reflects blue and absorbs all other colors appears blue to our eye. However, this only occurs if the object is being illuminated by a light source that emits blue light. For HPS lamps almost no blue light is emitted, so a blue object will appear very dark. HPS, fluorescent and induction lights have large missing areas in their color spectrum that can cause colored objects to appear off-color or even dark. That means that additional task lighting can sometimes be required. equipment as well as improving worker safety with less chance of accidental slips and trips. SafeSite illumination fixtures can deliver significant value in these locations whether in new installations or retro-fitted thus making expensive re-lamping costs a thing of the past. Their benefits, however, go much further. Light pollution is greatly reduced with SafeSite lighting fixtures which utilize the latest LED technology with proprietary optics designed to focus light directionally so that they illuminate only the required area within the Valero refinery, such as straight walkways, avoiding adjacent and upward light spill. Unlike conventional lights, LED fixtures are designed to retro-fit to multiple alternative fixings like walls or stanchions and can also be used as side-by-side modules to expand an application. Some large users of conventional lighting will carry a range of a few dozen types of fixtures to fit different locations, so using such multi-purpose LED fixtures can drastically reduce the amount of inventory to be carried in order to maintain lighting in different situations. Use of LEDs opens up access to many other benefits in hazardous location installations like this. One is their excellent performance in low operating temperatures. Dialight’s LED fixtures are rated down to -40°C and still provide 100% of the rated lumen output, unlike fluorescents whose output decreases rapidly at low temperatures. This makes LED fixtures ideal for use in extreme locations and in exposed exterior installations. Unlike conventional lights which can take minutes to warm up, LEDs achieve 100% light output from the second they are switched on. This ‘instant-on’ ability can be very significant in hazardous locations that use independent generators. These can be prone to blackout and brown outs, resulting in the need for additional emergency lights. By fitting LEDs to the central battery or standby power systems expensive downtime and unnecessary exposure to danger can be avoided. Instant-on ability also creates more opportunities to save energy. LEDs can be coupled with occupancy sensors and either completely switched off or reduced to a lower illumination level when no one is present around the installation. This not only reduces energy but dramatically extends the operating life of the lighting system. All in all, the replacement of traditional lighting with Dialight’s SafeSite LED technology is delivering multiple benefits for Valero and helping it maintain its strong environmental and safety focus in its operations. and Mexico. More information is available at www.dialight.com. Valero Energy Corporation is a Fortune 500 company based in San Antonio, with approximately 22,000 employees and 2007 annual revenues of $95 billion. The company owns and operates 16 refineries throughout the United States, Canada and the Caribbean with a combined throughput capacity of approximately 3.1 million barrels per day, making it the largest refiner in North America. Valero is also one of the nation’s largest retail operators with approximately 5,800 retail and branded wholesale outlets in the United States, Canada and the Caribbean under various brand names including Valero, Diamond Shamrock, Shamrock, Ultramar, and Beacon. Please visit www.valero.com for more information.